Here are some 'new' mugs that I'm working now. Today will be slightly abbreviated in the studio. I'm planning some play time with girls this afternoon and I'm cooking dinner! WooHoooo. Maybe Paella! 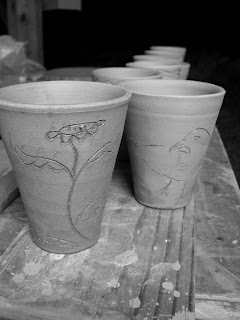 My plans include painting lots of bird imagery as well vines on the pots. Last firing cycle I failed to paint enough of our feathered friends. So I want to make up for that. 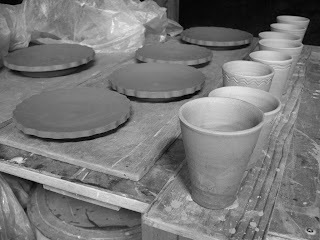 The majority of the pots will be for salt glaze, but I have a few that I want to glaze with my alkaline ash glaze. 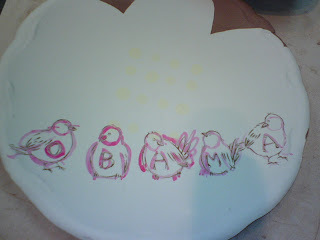 Also on the slate is my "Obama-ware". Ayumi Horie is hosting an online sale. 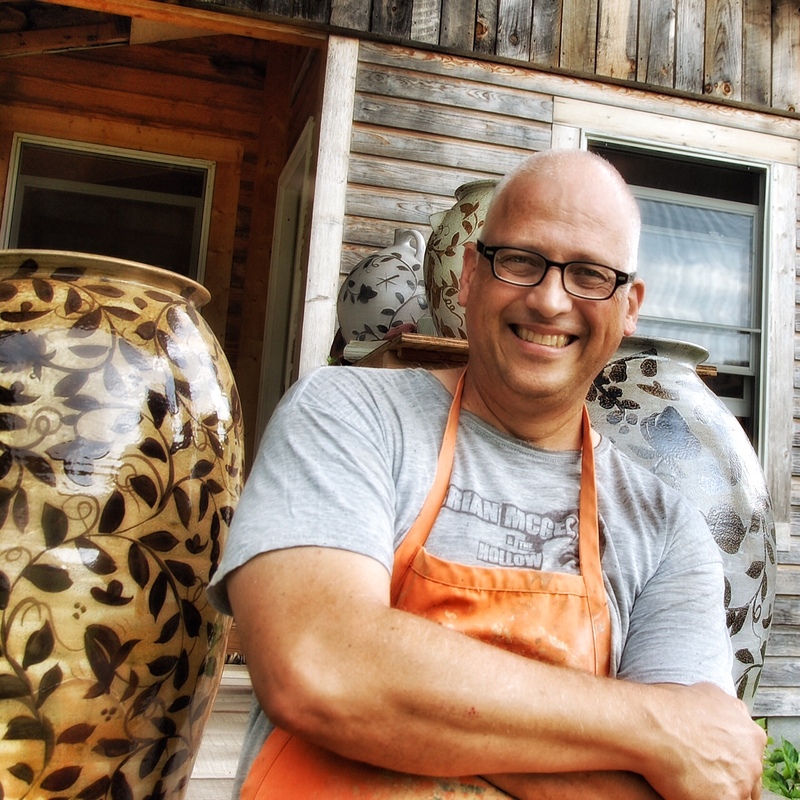 See the list of participating potters here. A percentage of the proceeds of the online sale will go to the campaign to elect Barack Obama and Joe Biden! You know you're in trouble when you're brewing coffee at 9 p.m. And you know you're in trouble when you're taking a picture of it. But it all sort of comes together here on the ole blog, it all makes sense here. Ahhh. I got this fine cup from Marty Fielding back in the day. [Charlotte ACC?] 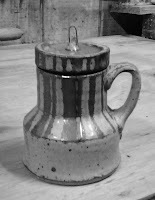 Tis being used for its fine lid that keeps the coffee warm on these chilly evenings when one is potting in the great out of doors. 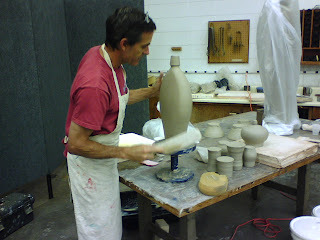 Sometimes in a blue moon I will unknowingly slap a ball of clay on the wheel head and start centering. 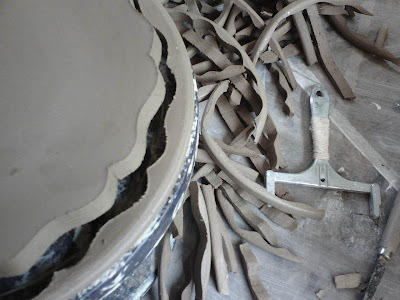 Before I know it the clay feels like its growing with a will of it's own. 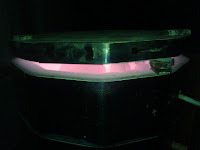 And before I know it the pot is made. Leach would say "born, not made." 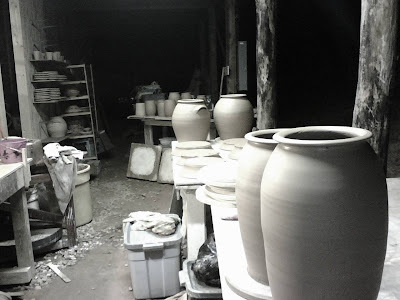 It happened last night in the wee hours after midnight at the end of a long pottery day. I had just been thinking that I would rather be sleeping, as my family was, down in our cozy little house. And then, whammo, here was this pot! I cut it off the wheel, washed my hands and hung up my soggy apron. As I looked for a spare horizontal surface that was out in the sun I found this gem of modern furniture. Doesn't this sum it all up? 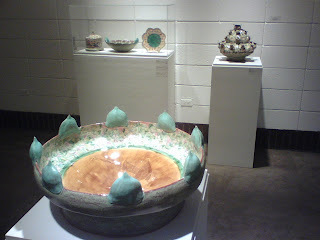 I took this picture with my handy dandy cell-phone-camera to exploit the rich colors of the table and the flat rather dull reddish brown of the drying clay pots. 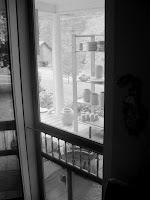 Micah and I installed the ol' L & L kiln on the front porch of the house a couple of days ago and I fired it off for the first time without a hitch. It's a long story, but basically I had to fire it on medium high since it's on a 40 Amp breaker and draws 44 A on high. 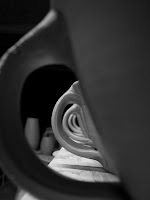 It was a lot of hassle to put the kiln there but better than depending on my potter neighbors to bisque fire again. No problems! 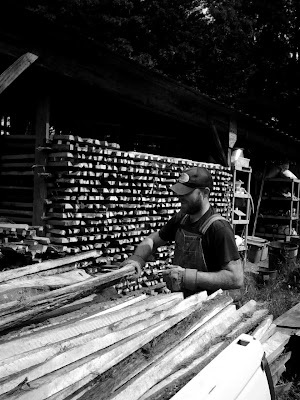 Micah had a few days of sawdust and ended up with this proud stack of mostly poplar. Here is the 'rick' before it's loaded. This is a fairly new system and is movable. In the end we can cut the same amount as my other more permanent cutting rick's. Here is the stack after being tied down and cut. 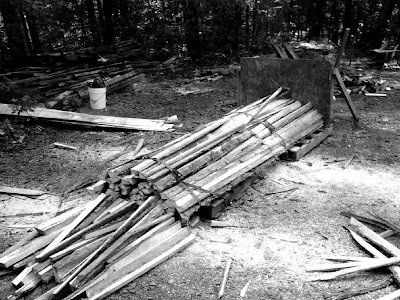 We usually cut the shorter ends off first, then make the middle cut, which yields two bundles of 60 inch sticks that will fit snauggly in the fire box. Now if I only had a little tractor....Hmmm. Where do I begin? Here a few pictures from the last couple of days. an interesting [to me] view. Yesterday was a fabulous day, when I had a moment to look up from my wheel, but I was reminded of something that I've known all along. 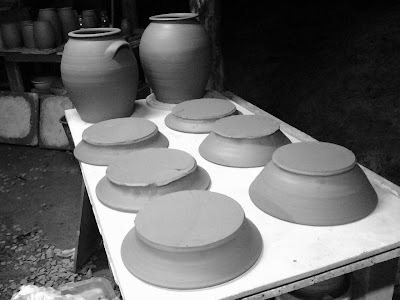 Pottery making takes time and attention. The weather was so dry and sunny that a board of cups that I had made in the morning was bone dry by noon, before I even had a chance to 'thumb' the bottoms or even leave my signature! Quite a new situation for someone making pots for seven years in a mushroom factory. 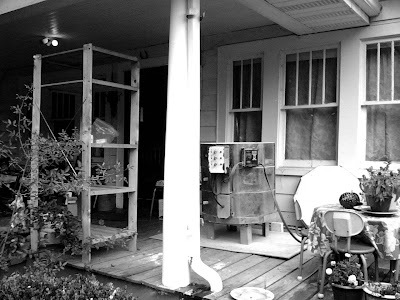 Today, Micah and I will go by the old shop and pick up the old electric kiln and bring it home to temporarily install it on my front porch. Probably not such a strange site here in NC. 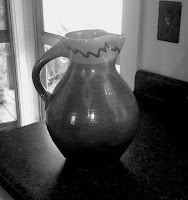 My friend Buck Pollard, married to a potter Jenny Sherburne, is coming over after supper to do the wiring with me. 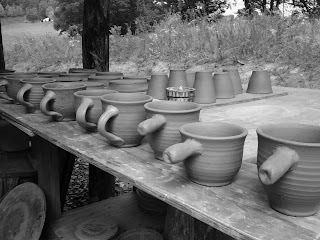 I will hopefully get back on making pots before the rain comes this weekend. It's a bit cold in the mornings and evenings and I haven't been able to work at those times. 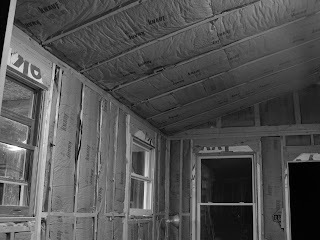 But tomorrow the insulators will come and insulate the new shop and we'll move the operation in there where I can have some heat. Phew, this is certainly a challenge. I'm afraid the pots will suffer. 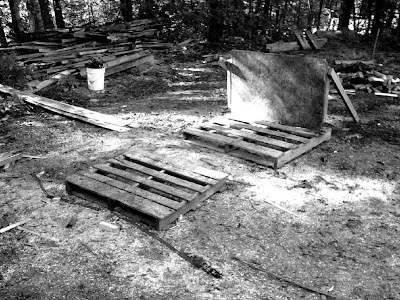 Micah cut and stacked wood, while I churned out feet on about 40 plates and cut the edges. 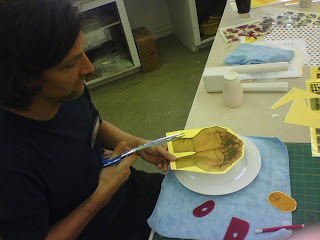 Some of the plates will become Obama-ware soon (more on that to come, stay tuned) and others will get incised. I thought that the pile of cut edges looked like a small hill of green beans, which we are now getting piles of from our garden. I just have to get out there and pick'em. I cooked some last week for Lillian and I with lots's of butter, salt and pepper. Mmmmm, I'd forgotten how good a green bean can be and I remembered what Bob Dylan sang,"Give me a string bean. I'm a hungry man!" I dreamt I was walkin' into World War Three. Wonderin' who turned the lights on. Up and down the lonesome town. I dreamt the only person left after the war was me. Everybody sees their self walkin' around with no one else. But all of the people can't be all right all of the time. I wanted to thank John Hartom, Lori Theriault, and the folks at Odyssey Workshop for having me over to show what I do yesterday. It was a brief workshop but I managed to show a few techniques, especially some brushwork strategies. The class at Odyssey is specifically aimed at making pots for an Empty Bowls event in support of the Manna Food Bank in Asheville, NC. Here are some video links I mentioned at the workshop for those who are following up. So I've decided that it was possible to fire again before the next show[October 11&12]! I hope I'm not wrong on this one. Micah Cain is on board again to help and he gives me the confidence that we'll get it done. After dinner I took my stroll to the studio, which I can't tell you how excited I am not to have to turn the key and crank up the old Ford to get there, not to mention looking up at the stars on the way back. As you can see I had some really soft clay and made a few 4 lb. plates. It's a good start. 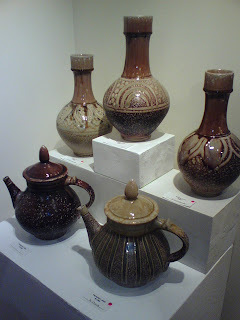 Tomorrow I have a demo scheduled at the Odyssey Clay Center in Asheville, but will get some more pots made in the morning. This is shaping up to be a real doozy with barely a week to make pots and just a few days to paint and glaze. Throw in some wood cutting and travel day and it's going to be interesting. I hope you'll be along for the ride. Went to cousin Daniel's [not my real cousin] show today and there is no substitute for seeing them live! 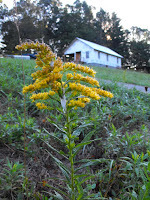 But if you can't go to Bakersville, NC you can see them via the gallery's web page here. 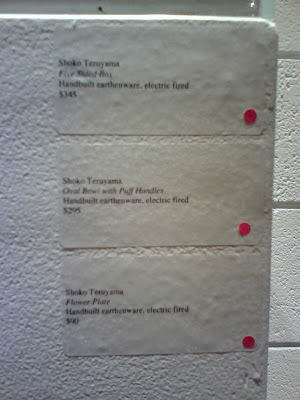 I attempted to photograph some of the groups at the gallery, but with apologies to the bad quality. 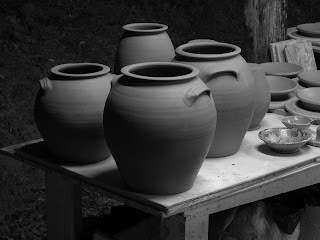 [I am shopping for a new camera] The pots are very light and the surfaces are very juicy and glassy. How much salt does he use, anyway? 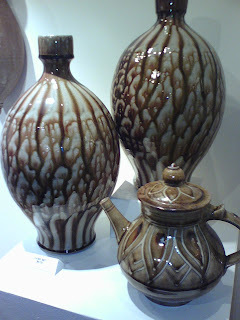 So here are some more pots from the show. 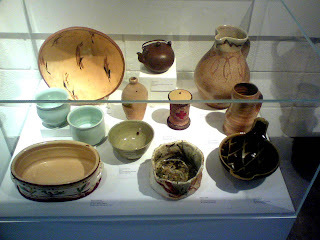 I also saw some nice pots by Josh Copus, David Eichelberger, and David Stuempfle. 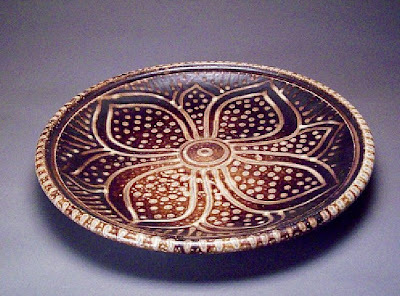 The owners of the Crimson Laurel Gallery, David and John have done a really nice job gathering some of the areas best pottery under one roof. 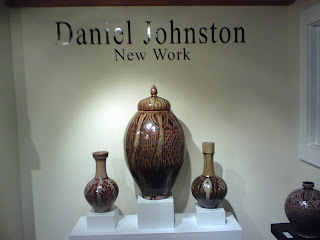 Our Seagrove area potter cousin Daniel Johnston has a show in our neighborhood at the Crimson Laurel Gallery in Bakersville. I haven't been to see it yet, but I'm heading that way today. The show is online here. I have wanted to write a little about my experience at the symposium at Arrowmont, but have been spending a lot of time recovering and refocusing. Now that it is Wednesday evening and I had a spare moment from a busy day of catch up, I wanted to start with this piece. 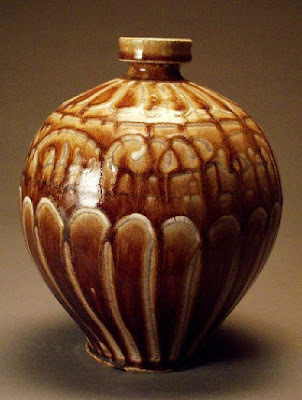 It is a wood fired jar by Ken Shipley located in my room at the Staff House. I shared the suite with my old pal Mark Shapiro. When I walked into the room, I spotted it right away. To borrow a phrase from Kim Ellington, I could have spotted it from 55 mph. I knew Ken Shipley at the University of TN Knoxville. Ken was a graduate student and was my very first teacher at UT when I took that fateful night class in 1983 that started it all. Although I seem to remember that Ken had to pass the baton at some point during that summer class, I got to know him after I become a real student in the pot shop. 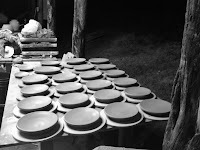 I was pretty new to pot shop and to the salt kiln and the anagama and helped out at a couple of firings along with Ken's firing buddy, Pat Houston. 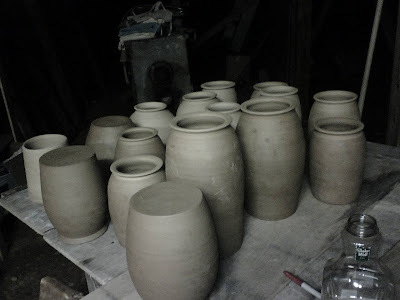 Ken made a lot of these jars, some of them pretty massive. 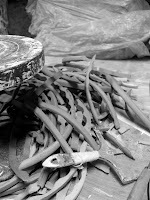 I remember going into his studio and smelling the clay that Ken had stored in big garbage cans. It had a peculiar odor of sour beer and who knows what else. Of course everything about his studio had some sort of intrigue. 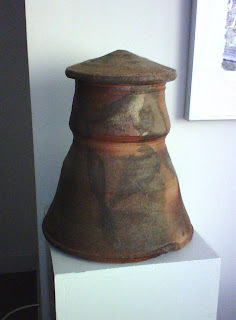 Ken inspired me to try to make big pots and use the anagama in my later undergrad years. Enough nostalgia, let's get back to this jar. I took a good look at it and noticed some beautiful subtle colors that are somewhat noticeable from this picture that I took with my cell phone. I'm not sure whether the patterns are solely from the flame. I seem to remember Ken wrapping pots with straw soaked in salt, but it's been a really long time. It's a real beauty. It was the next best thing to seeing Ken who I haven't seen in some years. He now teaches at Austin Peay State University in my hometown of Clarksville, TN. Here is Ken's web site if you want to see what he's been doing lately. Here are a couple of old pictures I retrieved from the vaults showing the firebox of the former UTK anagama built* in 1981(?) by Shiro Otani at the Melrose Ave studio. 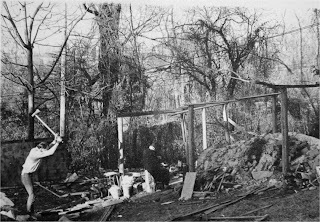 On the right is a picture of the kiln and that's Peter Rose chopping wood. (I can't remember if I have already published these pictures in another post.) Peter lives and makes pots in Knoxville to this day but hails from Australia. After Kenny graduated and moved on Peter came around, (thank God!) 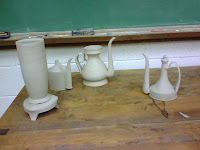 and helped all of us Art students fire the kiln. We were pretty much clueless. 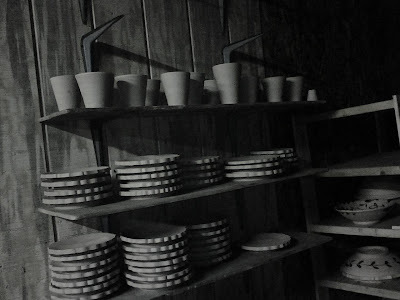 I had helped Kenny fire a couple of his kiln loads, but really hadn't fired by myself. So, I owe a lot to Ken and Peter! All these memories (and I could go on, but I'll spare ya for now) from a jar. 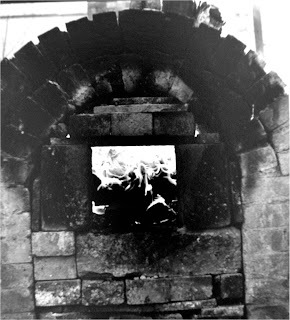 The kiln was actually built by Ken Shipley, Stephen Frazier, Patrick Houston, and others after the kiln built at Arrowmont built by Otani. 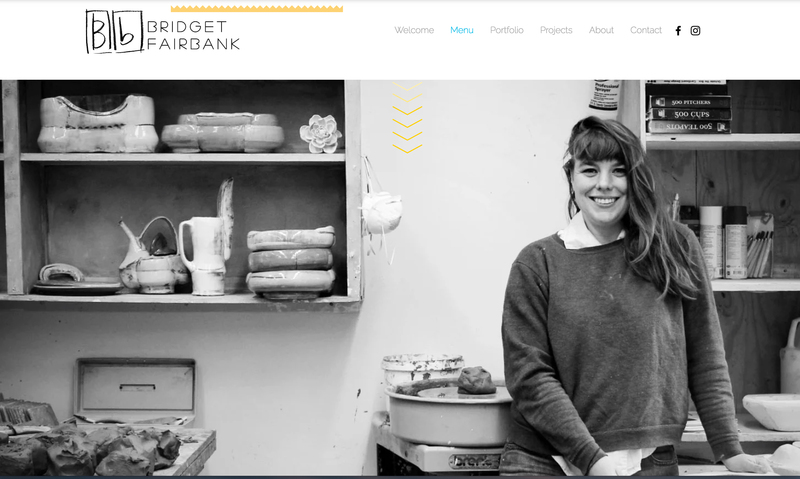 Hannah McAndrew has reported the death of Alan Gaff of Argyll Pottery at her blog. 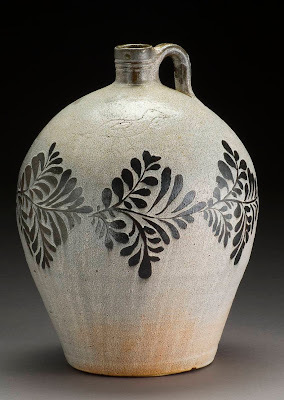 Those of you have read his blog were just getting to know Alan and his pottery through his generous writing and photography. As Hannah has said, none of us want to believe that this tragedy has occurred. I will miss his reporting from one of the most beautiful places in the world. I suppose if you were to criticise my work you could say that most of my pieces are quite stayed and safe but I have always tried to make my work for those three harshest of critics, Alan and Mr and Mrs General Public, they do not suffer fools gladly. 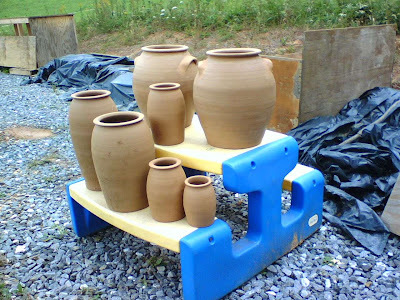 As we sell to a very wide range of folk straight off the road, the sign says POTTERY, that is what you expect and you may not always like our colours or style but with us pottery is usually what hopefully you get, well made, robust and functional pottery. (Apart from the ceramic motor bikes, the roe deer and horse sculptures, the skull night lights at Halloween, the wee animals, pottery pipes, kiln dragons, mushrooms, toadstools, wood mice, frogs, cones, tulip vases, lily forms etc). O, K, so if you bother to look you will probably find something different here, all you have to do is come and see. 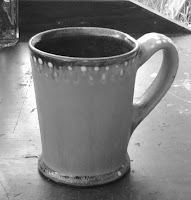 Today is a little cooler than normal and it's a bit overcast here, for now, so I've broken with the traditional cup of coffee and reached for this big ole mug made by my good friend Dan Finnegan to make a cup of tea. 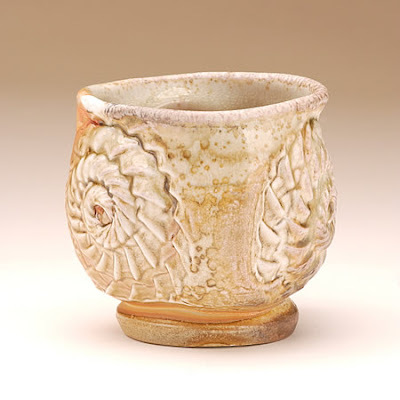 It's a big cup and the glaze is a beautiful olive green to amber over a crackle slip. 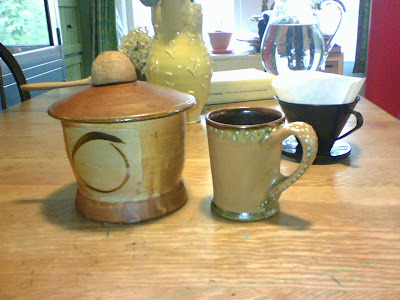 This mug is too big for my coffee but makes a great tea mug that keeps the tea warm in these cooler days. Dan originally donated this mug for a "Empty Cups" event we were planning for the New Orleans NCECA that was canceled and moved to Pittsburgh. So he agreed to give it to me in exchange for one of my mugs. But this is a gentle "reminder to self" to send Dan a mug! Guilty as charged. Sorry Dan. 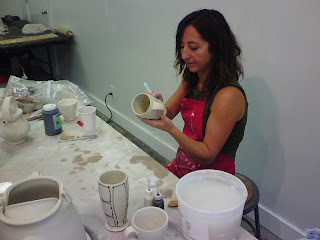 I'll make some mugs for next firing and pick the best for you. It's also appropriate that I make my first tea of the Fall with one of Dan's cups. A few years ago I taught at Penland with Dan and we overlapped a little bit with the same class. Dan had tea every afternoon with the class and it was a very nice time to stop our work and sit down together and have tea and talk about whatever, usually pottery. So I carried on the tea time after Dan left. It was great. 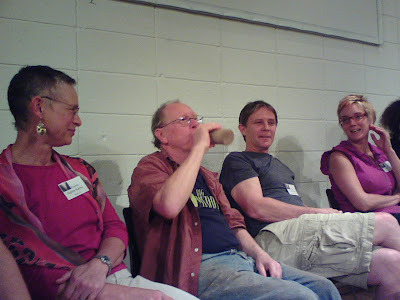 Then I taught again a couple of years later and, to my surprise, and glee, one of my students, I believe it was Ron G. presented me with a care package from Dan, full of tea, some sweets and a note wishing me a good workshop. What a mensch! [that's Yiddish for mensch] So this mug of Earl Gray goes out to Dan! I'm thinking about you today buddy, as I sip my tea. Read Dan's blog, it's a good one. 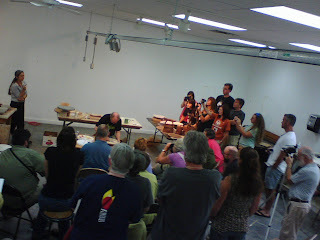 The Utilitarian Clay Conference was a very intense and gratifying experience. Being a presenter was like a dream and even on the last day when we all sat on the stage talking about our favorite pots, I was still pinching myself, thinking how lucky I was to be part of this rare and fantastic event. I had great conversations late into the night with my colleagues and heros. There were also great discussions from all of those who came and gathered in the demo rooms. I wanted to thank all those folks who came up and introduced themselves to me (I hope you're reading!) and appreciate their kind words. Sitting here today, I still can't believe it happened, but seeing the nice pictures that Tracey took is proof that it actually happened and that I was there after all. I was sad that I didn't get to see Daphne Hatcher, Bede Clarke, Linda Sikora, and Ayumi Horie make their work. We all were "working" at the same time in separate rooms. 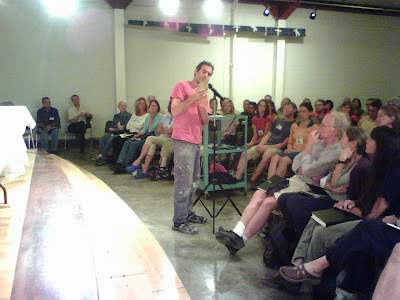 Arrowmont will be releasing podcasts of the symposia , maybe I can catch up then. I'll be sure to post links here when that happens in the near future. Until then I will be collecting my thoughts and sharing the few pictures I had time to take at the symposium this week. An Ayumi plate with a seasonal message. 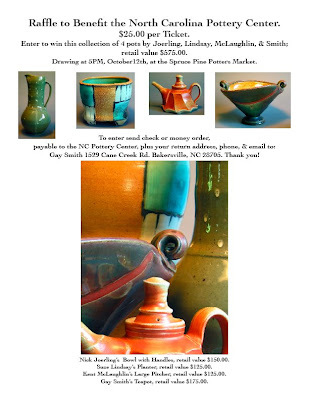 Here is a chance to help yourself to some great pots and help the NC Pottery Center all at the same time. Click on pic for a full size version. Gallery! I'm so happy for my "invitee", colleague and friend, Shoko Teruyama. Wish you were here. 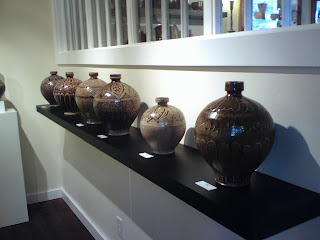 Your pots look really beautiful!